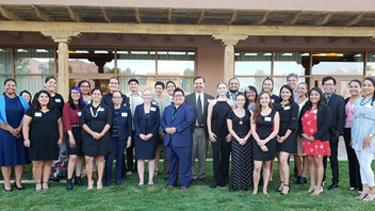 On September 18, 2018, the UNM Law and Indigenous Peoples Program held its annual Welcome Dinner for Native students entering their first year of studies at the University of New Mexico School of Law. The event took place at Sandia Resort & Casino, within the homeland territory of the Pueblo of Sandia. Students, faculty, and staff who attended the annual Welcome Dinner for Native students beginning their studies at UNM School of Law. Faculty members pictured are Prof. Sonia Gipson-Rankin, front row, far left; Professor Christine Zuni Cruz (Pueblo of Isleta/Okhay Owingeh), front row, 5th from left; Vice Dean Camille Carey, front row 6th from left; Professor John P. LaVelle (Santee Sioux Nation), back row, 5th from left; Professor Laura Spitz, back row, 7th from left; and Dean Sergio Pareja, back row, 9th from left. Not pictured is Professor Kenneth “Kip” Bobroff, who also attended the Welcome Dinner and offered encouraging remarks. Most of the Law School’s seventeen Native American entering students—fifteen J.D. candidates and two students pursuing a Master of Studies in Law (M.S.L.) degree—attended the Welcome Dinner and offered inspiring comments about their personal journeys and the importance of their decision to attend UNM School of Law. Also attending were faculty of the Law and Indigenous Peoples Program; Dean Sergio Pareja and Vice Dean Camille Carey; other faculty members who teach in the law school’s first-year curriculum; staff members who provide support services for the law school’s Native American/Indian law community; Native student leaders of the UNM Tribal Law Journal and the UNM chapter of the Native America Law Students Association; and Helen Padilla, director of the American Indian Law Center, Inc.
For decades UNM School of Law has been a national leader and innovator in offering specialized programming, including an Indian Law Certificate program, for Native Americans and students interested in pursuing the study of Indian law. Native Americans and tribal members ordinarily comprise ten percent or more of the law school’s student population. In addition, five tenured faculty members—nearly one-fifth of the law school’s regular tenure-stream faculty—are enrolled citizens of federally recognized Indian tribes, a number and percentage unmatched by any other law school in the country.